In the early 1990s, following the collapse of communism, US policy concentrated on promoting the democratization of the new governments that emerged. There was keen concern with how these successor regimes could control and redirect their intelligence services, since these very services had been the sine qua non of totalitarian rule. Kiernan Williams and Dennis Deletant provide one of the first in-depth looks at the progress that the Czech Republic, Slovakia, and Romania have made in establishing democratic control and accountability for their security services. This is serious scholarship, rich in the theories of democratization and with a well-considered framework for comparative analysis of the progress that the new governments have made. 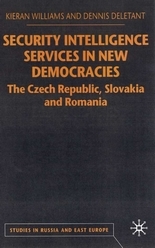 The authors provide excellent, brief histories of the security services, and detail the unique circumstances that have characterized the development of each one. Williams and Deletant argue that all three governments have institutionalized some legislative oversight and executive control over the security services, but that they have followed quite different courses toward these objectives. The Czech and..